Reunion 2018 … and a flight missed ! We, the PGPMAX batch of 2013 had our 5th year reunion on Nov 23rd and 24th. This time we were invited by the school to hold it at the ISB Hyderabad campus. It was an opportunity to relive the time that we spent there during our program. I couldn’t go on the 23rd and decided to go only on the 24th. Vandana too decided to join me and we booked our tickets by the same flights. We took the early morning 6.40 am Indigo flight from Delhi to Hyderabad. Krishnan dropped me off at Vandana’s place, just like he would when we attended classes and the only person missing was Akash. We reached the airport in time, breezed through security as we had no luggage, just our respective purses. As Vandana had not even had tea, we decided to have a bite in the lounge. We went up to the first floor and had some tea/coffee, and breakfast. I had set the alarm for 6.15 so that we wouldn’t miss boarding the plane. We left at 6.15 and proceeded to our gate and found no one there !!! Initially we thought the flight had not boarded as yet but we soon realised that the gates had closed after passengers had boarded. We rushed to the next gate and found a manager from Indigo and about 10 other passengers who had all missed boarding the flight. Apparently Indigo closes the boarding gate 25 minutes before departure and we were a couple of minutes late. But many of the other passengers had reached 25 minutes before but the gate had still been closed. Since T1 is a silent airport, there were no announcements. We all requested the manager to let us go through and board the flight as there was still 20 minutes to take off. He just refused and asked us to take the next flight. We were taken to the check-in counters on the last row and they were gracious enough to take 2500/- as standard charges for putting us on the next flight or the ticket price differential whichever was lower. We got onto the 8.35 am flight and Vandana and I stood outside the boarding gate an hour in advance and guess what … the 8.35 am flight was boarded by 7.35 am ! I get the “being on time is a wonderful thing” slogan of Indigo, but this is taking things too far. Anyway, for both Vandana and I – it was a first, to miss a flight when we were in the airport on time. For me it was a double whammy, besides Siva and others teasing me Krishnan has filed this information away for further use…. I will be reminded of this at all appropriate opportunities :):):). Huge advantage to Krishnan like they say in Masterchef Australia. We reached the classroom around 11.30 am as the “The promise of Blockchain” session was winding down with Prof Bhagwan. Met Kavita after a couple of years just as we were entering the classroom. We then had an AWESOME talk by G V Sanjay Reddy of the GVK group. He shared his journey as an entrepreneur and it was fascinating. Krishnan and I recently flew out from the Mumbai airport and we were super impressed – it was great to meet the man behind that airport being as awesome as it is. After Sanjay Reddy’s session, we had the lunch break. The atrium was nicely decked up for lunch. Post lunch, Antony had the difficult “hour” when he spoke of “Impactful story telling for business” and Antony didn’t let us sleep a wink ! He is obviously a master story teller and an engaging one too :). Then it was the session on “Women Empowerment”. I was on the panel along with many rising stars from other Pgpmax batches. It was an interesting session and we need to engage some more as more women get into senior roles and break the glass ceiling everywhere. 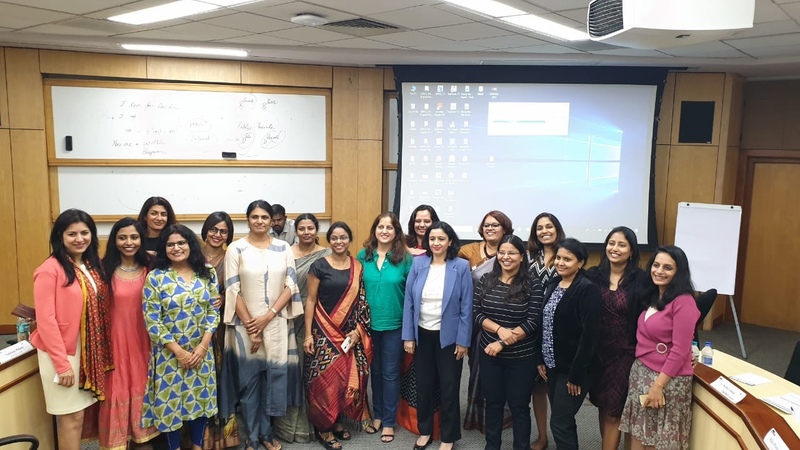 There were videos put together for several of the Pgpmax women alumni by Mahua Mukherjee’s (Pgpmax 2014) company titled “The star in me” and these were shared during this session. Here’s mine – The Star in Me. 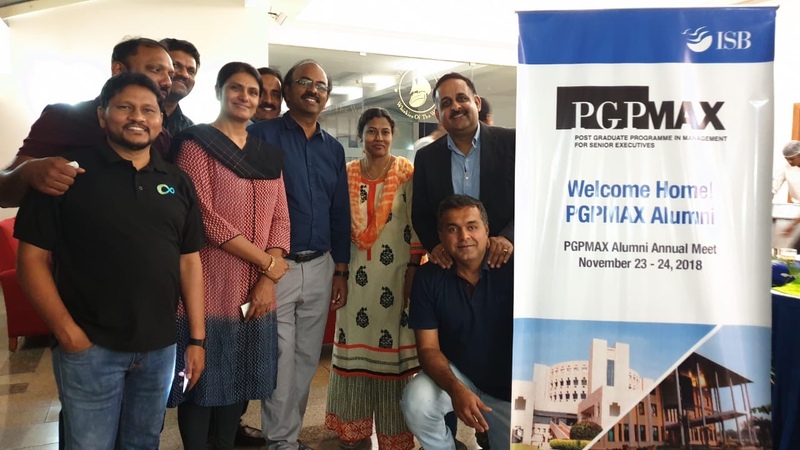 This time we had some of the other Pgpmax batches join in as well for the reunion so our batch broke off and went out to an adjoining room for our “reflections” session, the main attraction of each of our reunions. We shared our updates, future plans and goals. We took a break from our reflections session for the Dean’s address. It was a nice session where the Dean shared updates about the school and we also asked a few questions. 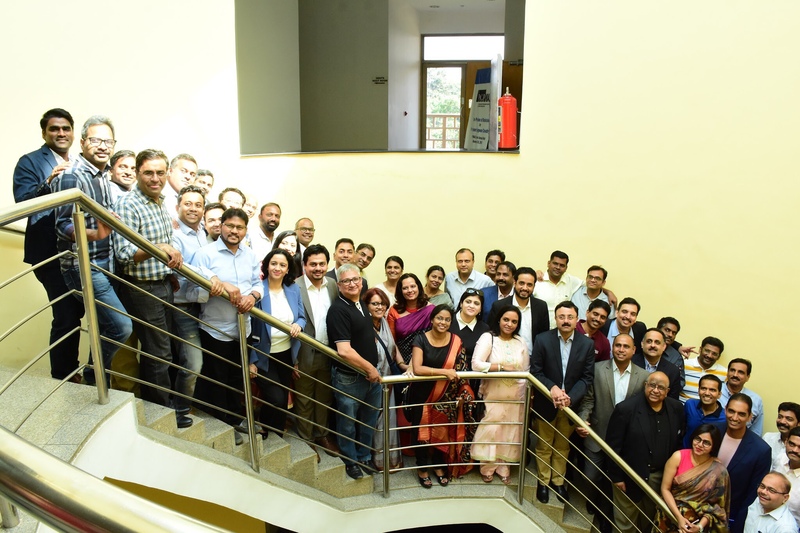 We then got back to our session and quickly closed out by 7.30 pm as Amit, Vandana and I had to reach the airport for our respective return flights. This time Vandana and I sat in front of the departure gate as we ate our dosas so that the flight couldn’t leave without us :). We let go of our tradition of eating at the “Idli factory” because it was on a different floor than the departure gate. Lesson learnt for life I guess. So yet another reunion done, a “packed” day, a few lesser people but no less fun. Our friendships are intact and we have each other’s back whether we show up for the reunion or not, but hoping we will have better attendance when we meet the next year.